Greek salad, teropita, dolmades, tzatziki sauce. 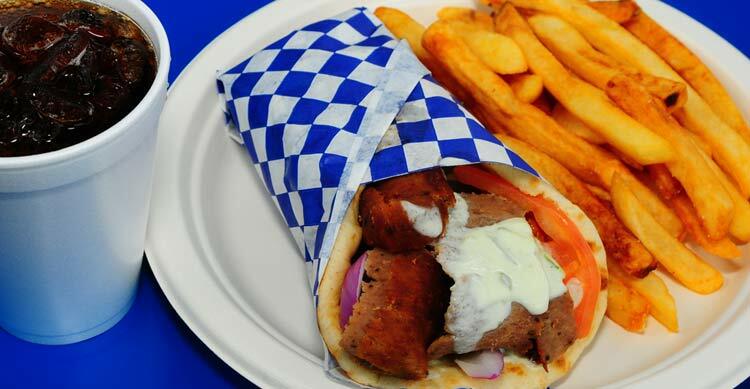 Lamb & beef gyro meat, served with greek salad, fries, tzatziki sauce, pita bread. Chicken gyro meat, served with greek salad, rice, tzatziki sauce, pita bread. Two chicken souvlaki served with greek salad, rice, tzatziki sauce, pita bread. Two lamb souvlaki served with greek salad, rice, tzatziki sauce, pita bread. Large greek salad, topped with gyro meat. Large greek salad, topped with chicken souvlaki. Lettuce, tomato, cucumbers, onion, feta cheese, peperochini, greek olives, greek dressing. Large greek salad, topped with five falafel balls. Small gyro sandwich with fries and small drink. With fries and soft drink. With greek fries and soft drink. With greek salad and rice pudding. Rice, milk, sugar, vanilla, cinnamon. Honey, walnuts, spices, layered on filo dough. With feta, oregano, lemon juice. Ask About Our Party Platters!